It is the most widely distributed firearm in the world. Over the years, it has undergone some modifications and improvements. The letter M in the model designation, means “Modernized” . This poster illustrates in cutaway form demonstrates the magazine, chamber and how the gas piston operating system is designed. This firearm uses shortened ammunition and has a shorter barrel than a standard rifle. It is meant for close-in assault use, and is the primary weapon of choice by most terrorist and insurgent groups. 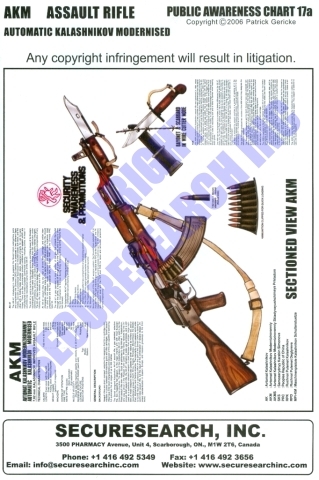 The poster is printed on both sides, and a detailed line drawing on the back (poster 17-b) is a full cutaway illustration of this firearm and its internal component layout.